Enjoy pure luxury with all the amenities of a Five-Star property in our fully staffed Villa set at the beach. 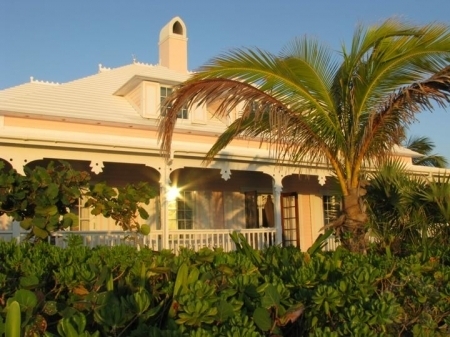 This impeccably detailed almost new but traditional Caribbean style villa with a wrap around covered veranda is located on a private beach adjacent to "New Plymouth" (an 18th century loyalist settlement in Green Turtle Cay, Abaco). A two-mile white sand beach runs north to south in front of the villa and the beautiful turquoise/aquamarine ocean is viewed from the east, south and north sides of the villa and is breathtaking! Villa Pasha features 5-airconditioned bedrooms, 4-bathrooms, a fully equipped kitchen, living/dining room, library, studio, whirlpool bath, fireplace and all the conveniences of home including high definition DirecTV service, telephone/fax, Wireless Internet Access throughout the Villa, VHF radio, Weather station, CD, video and DVD players. The villa is provided with 4-bicycles, beach towels, linens, towels and utilities. Our housekeeper works every day except Sunday and the caretaker is available every day for assistance.